There are a lot of blogs out there that will talk about the beauty of motherhood. There are a lot of memes and cute stories out there about how as a new mom, you don’t have time to shower, shave or brush your teeth. It almost seems like a badge of honor. While only a mother of one, I call BS on that. Your situation might be different, and you might not get to do things in the exact order you want to, but it’s very important for the both of you to take the time to take care of yourself. I’ll even go so far as to say it’s important to feel a little pampered. The rest of your day may feel like your space isn’t yours, so be sure to carve out a few minutes for yourself. Your baby will thank you in the end. I’m not a makeup to leave the house kind of girl. I worked as a carpenter for 6 summers and work in the ski industry full time in the winter. Vermont is not really a put your face on before you drink your coffee kind of place, but people generally take good care of themselves. Health and beauty is more than foundation, it’s an attitude, and a general awareness of what you’re putting in your body. In the first few weeks of motherhood, there were days I didn’t even make it out to the mailbox. Despite all that, I made sure to get up, change out of my PJs (into yoga pants), brush my teeth and wash my face. Was I ready for prime time? No, but I felt a little more like myself in the aftermath of such a big life change. This was about the time my friend Trish shared with me some inconvenient truths about the state of the personal care and cosmetics industries. Looking at this little life that I’d given so much of myself to create and care for, I couldn’t imagine not changing our buying habits and switching to safer products. You should see some of the ingredients in baby shampoo! 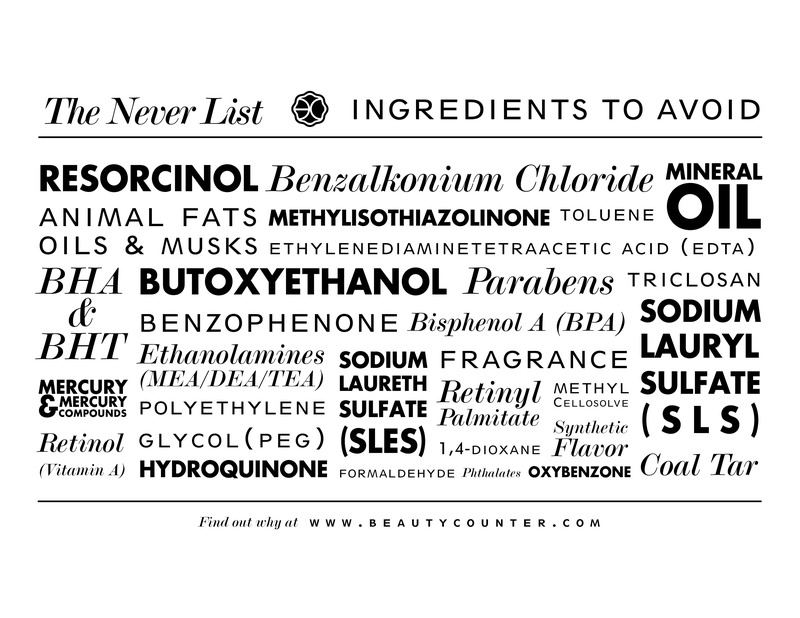 With everything else going on, being able to trust Beautycounter’s Never List (over 1500 ingredients we’ll never use, including the 1400 banned in the EU and the 11 banned in the US) and work with a company passionate about educating people to be conscious consumers is something I’m excited about. My family deserves safe products. I deserve 5 minutes twice a day to not be a mom and care strictly for myself. It doesn’t make you a better mom if you lose yourself completely in your kids. If you feel good, that will show. Especially as your kids age, they will pick up on it, and your attitude about your body and self will rub off on them. It’s not enough to tell your daughter that her self worth is not based on her looks, then put yourself last on the care list. You can’t pour from an empty cup. Motherhood is beautiful, but you’re a part of it, so don’t lose yourself. There’s always time for things you make time for.